(PhysOrg.com) -- Hawaii may be paradise for vacationers, but for geologists it has long been a puzzle. Plate tectonic theory readily explains the existence of volcanoes at boundaries where plates split apart or collide, but mid-plate volcanoes such as those that built the Hawaiian island chain have been harder to fit into the theory. A classic explanation, proposed nearly 40 years ago, has been that magma is supplied to the volcanoes from upwellings of hot rock, called mantle "plumes," that originate deep in the Earth's mantle. Evidence for these deep structures has been sketchy, however. Now, a sophisticated array of seismometers deployed on the sea floor around Hawaii has provided the first high-resolution seismic images of a mantle plume extending to depths of at least 1,500 kilometers (932 miles). This unprecedented glimpse of the roots of the Hawaiian "hot spot" is the product of an ambitious project known as PLUME, for Plume-Lithosphere Undersea Melt Experiment, which collected and analyzed two years of data from sea floor and land-based seismometers. 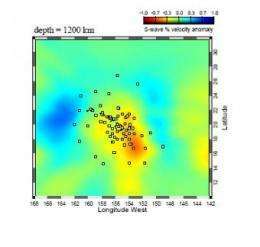 "One of the reasons it has taken so long to create these kinds of images is because many of the major hot spots are located in the middle of the oceans, where it has been difficult to put seismic instruments," says study co-author Sean Solomon, director of the Carnegie Institution's Department of Terrestrial Magnetism. "The Hawaiian region is also distant from most of the earthquake zones that are the sources of the seismic waves that are used to create the images. Hawaii has been the archetype of a volcanic hotspot, and yet the deep structure of Hawaii has remained poorly resolved. For this study we were able to take advantage of a new generation of long-lived broad band seismic instruments that could be set out on the seafloor for periods of a year at a time." The PLUME seismic images show a seismic anomaly beneath the island of Hawaii, the chain's largest and most volcanically active island. Critics of the plume model have argued that the magma in hot spot volcanoes comes from relatively shallow depths in the upper mantle (less than 660 kilometers), not deep plumes, but the anomaly observed by the PLUME researchers extends to at least 1,500 kilometers. Rock within the anomaly is also calculated to be significantly hotter than its surroundings, as predicted by the plume model. "This has really been an eye-opener," says Solomon. "It shows us that the anomalies do extend well into the lower mantle of the Earth." Erik Hauri, also of Carnegie's Department of Terrestrial Magnetism, led the geochemical component of the research. "We had suspected from geochemistry that the center of the plume would be beneath the main island, and that turns out to be about where the hot spot is centered," he says. "We also predicted that its width would be comparable to the size of island of Hawaii and that also turned out to be true. But those predictions were merely theoretical. Now, for the first time, we can really see the plume conduit." Has the question of hot spots and mantle plumes been settled at last? "We believe that we have very strong evidence that Hawaii is underlain by a plume that extends at least to 1,500 kilometers depth," says Solomon. "It may well extend deeper, we can't say on the basis of our data, but that is addressable with global datasets, now that our data have been analyzed. So it's a very strong vote in favor of the plume model." The lead author of the study, published in the December 4, 2009 issue of Science, is Cecily Wolfe, a former Carnegie Fellow at the Carnegie Institution's Department of Terrestrial Magnetism now at the University of Hawaii at Manoa. Other authors are S.C. Solomon and E.H. Hauri, Carnegie Institution for Science; G. Laske and J.A. Orcutt, Scripps Institution of Oceanography; J. A. Collins and R.S. Detrick, Woods Hole Oceanographic Institution; and D. Bercovici, Yale University. The PLUME project is supported by the National Science Foundation. That's Ancient, Primitive Material Down There! Many years ago we found that an olivine xenolith - that had been carried to the surface from a hot spot by an Hawaiian volcano - contained the decay products of extinct I-129 and Pu-244 from the very birth of the solar system. I.e., the decay products had remained trapped inside the Earth for about 98% of the lifetime of this planet, 4.5 Gyr/4.6 Gyr. See: "Noble gases Hawaian xenolith", Nature 257, 778-780 (1975).